It has a handy charging port for all your standard USB type devices, plus a 12V/10A accessory port and a 19V/3.5A laptop port (which require optional adapters). The 12V port can power accessories that have a cigarette lighter plug like a lantern or air compressor and some laptops. The 19V port will charge some laptops (but not the MacBook Pro, which uses Apple’s proprietary MagSafe connector; MacBook with USB-C can be powered only via the USB port). Weego 44 has a fairly hefty battery that can charge devices like the Apple iPhone 8 six times or the Samsung Galaxy S9 four times. The system is cleverly designed to charge your phone and tablets at their fastest possible rate so you’re not waiting for power any longer than you have to. Weego 44 can be fully recharged in about three hours – and you can do that up to 1,000 times and sit on standby for up to three years. It also has a built-in 500-lumen dual-LED flashlight with a 14-hour life. 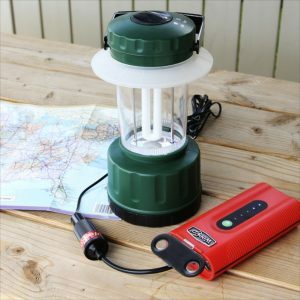 In case of emergency, the strobe and SOS modes can flash for up to 28 hours. The jumper cable is equipped with Smarty Clamps that grip snugly to the battery terminals and won’t activate until properly connected. A green light and no beeps means you’re good to go. The system also shuts down in the event of a power surge. It has a bright orange, compact, rugged shell, weighs a mere 700 grams and is water, dirt and dust resistant. It won’t quite fit in your pocket, but it’s small enough to go anywhere you do. You may also want the OBDII 12V Memory Saver with 1.4-metre cable. If you’ve ever had to disconnect your vehicle’s battery, you know what a pain it can be when you lose all your presets – radio, GPS, seat setting or even keyless entry codes. This $30 accessory will save time and annoyance – and help you avoid a costly trip to the dealer. Just connect the cable to your car’s OBDII port and to Weego before disconnecting your battery and all your settings will be saved. 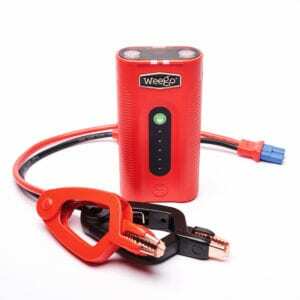 Weego Jump Starter 44 retails in Canada for $219.99. It comes with Smarty Clamps, wall and car chargers, a hook and lanyard for hanging, a matching water resistant pouch, manual and quick-start guide, and a respectable 18-month warranty. You can find it at myWeego.ca, PartsEngine.ca and Amazon. Gadgets constantly evolve, so the upgraded Weego 44N will be available soon. It will have the same functionality, with a 10 per cent boost in cranking power – 440 cranking amps (2,100 peak amps). It will also have new AutoBoost technology, in which maximum power is automatically sent to dead batteries without an override button. This new feature is designed to eliminate all guesswork but is still incredibly safe. NOTE: This article was also published by Troy Media as: Wherever we go, WeeGo goes to keep our devices powered up. A variation appears in the September/October 2018 Active-Life Magazine on page 18 and on-line at Simply Tech at homepage.ca.